After consistently positive experiences with machines already delivered, a third sintering line at a Dutch steel mill will also be equipped with an AUMUND special conveyor for the conveying of hot sinter material. 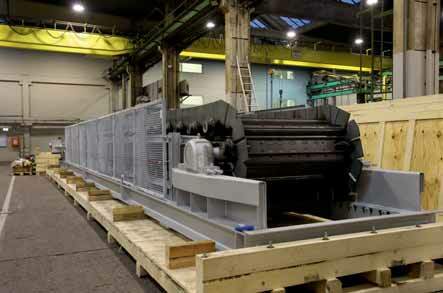 For this line an AUMUND conveyor type KZB-S 2400 type (pan width = 2,400mm) with a length of 13.5m will be installed. The conveying capacity has been designed for 250tph (tonnes per hour) of hot sinter at a material temperature of 500–1,000°C. Two years ago, the AUMUND-engineers gained first experiences in working with the Dutch iron and steel industry client: initially there was the challenge to renew the conveying system at the end of a sintering machine within an installation that had been producing for decades. Due to a high amount of maintenance work and frequent downtimes, the oscillating conveyors had to be replaced. AUMUND specialists initially suggested replacing the vibrating conveyors with metallic plate conveyors. Since with a vibrating conveyor the highly abrasive sintering material is wearing constantly by vibration on the fixed bottom plates, a metallic pan conveyor whose plates are moving constantly with the material is clearly the better technical solution for the present case. Due to the different construction and measurements of a vibrating conveyor compared to the installation dimensions of a metallic plate conveyor, a specialized solution had to be found. Besides, the conveyor has to meet very high demands on temperature, wear and static as well as dynamic loads. On the other hand it has to be integrated into the space available. An additional demand was to keep the assembly time for the conversion as short as possible. Finally, instead of an installation on the usual stanchions, the conveyor was mounted in a torsion-resistant frame. The drive head, the tensioning station and the railway support were integrated into the compact frame also. The conveying element combines the AUMUND deep-drawn pan conveyor with supplemental wear caps. Experiences from operations of an already existing line have demonstrated that with the pan conveyor the service life of the troughs could be expanded from a few months to approximately 2.5 years at this time. At the same time the effort needed to replace the conveying element is significantly less. “With further improvements to the conveying element and the wear caps, an additional increase of the service life can be expected,” says AUMUND project manager Frank Reddemann. The conveyors were delivered in December 2014 and were mounted and brought on line during a scheduled downtime. The delivery of the current order — by now the third conveyor — for the Dutch sintering plant is planned for September 2015. The start-up will be presumably at the end of the year 2015 after completion of the conversion process. Transport will be in a fully assembled state by truck. Thus the usual time for mounting and alignment of the various assemblies can be extremely reduced. dealing with bulk materials. With their high degree of individuality, both its technically sophisticated as well as innovative products have contributed to the AUMUND Group today being renowned in many areas of conveying and storage technology. The manufacturing companies AUMUND Fo¨rdertechnik GmbH (Rheinberg, Germany), SCHADE Lagertechnik GmbH (Gelsenkirchen, Germany), SAMSON Materials Handling Ltd. (Ely, England), as well as AUMUND Logistic GmbH (Rheinberg, Germany) are consolidated under the umbrella of the AUMUND Group. In conjunction with the headquarters of the manufacturing companies, the global conveying and storage technology business is spearheaded through a total of eight locations in Asia, Europe, North and South America.